The Newly updated Sole F80 is now even more powerful and roomier that it was during its debut. This new F80 treadmill has super-sized 22-inch by 60-inch running surface as well as a commercial-grade 3.5 CHP motor. This latest version also features a vibrant 7.5-inch LCD screen. 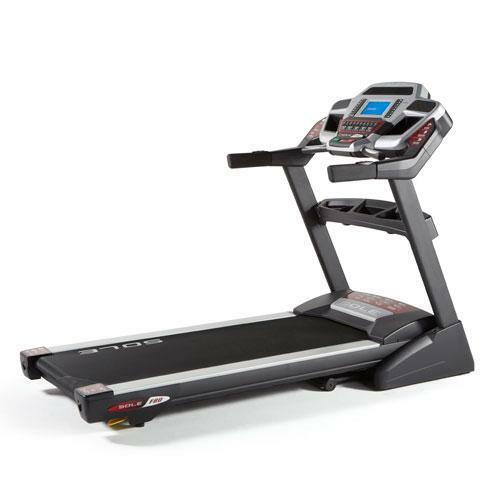 This new Sole F80 treadmill has all the wonderful features of the original: excellent cushioning, whisper-quiet operation, Sole’s signature horseshoe design, as well as 10 preset workout programs. The home treadmills from Sole feature many commercial-grade components and the F80 is no exception. These components ensure that their products are not only durable but also support your health by reducing then shock of impact. The F80 features a track with many beyond-average features. First, the super-sized workout area is probably the widest and longest you will find with dimensions of 60”x 22”. Second, the 2-ply track runs over 2.75-inch rollers for longevity. Thirdly, you get to enjoy CushionFlex technology, which is a technology that has been proven to reduce joint impact by 40% when compared to asphalt. This means that the impact reduction in Sole is among the best in the industry. Finally, the track has a 15% incline. When working out on an incline, you stimulate different muscles for better toning and burn calories more efficiently. You can fold up the F80 if you wish to save on space but the unique horseshoe design helps in making the treadmill quite sturdy. The new Sole F80 treadmill features a 3.5 CHP motor that can comfortably support a user that weighs up to 375 pounds. The motor’s high speed is 12 mph and this makes the treadmill good for both walkers and runners. The incredibly quiet motor features heavy-duty flywheels. The warranties from Sole are among the most generous ones in the fitness industry. The F80 comes with a lifetime warranty on the motor and frame, as well as a 5-year warranty on parts and electronics, as well as 2 years on labor. The treadmill features soft blue backlighting that illuminates a crisp display of the workout data. The alphanumeric screen also displays useful information from the user’s manual. The Sole F80 treadmill features in-built speakers that can play music from various sources including iPods and other MP3 players. Unlike the Sole F63 that is one step down, the F80 features a wireless hear rate monitor. If you wish to work out for longer, there is an in-built console fan. Finally, the controls for the speed and incline are built into the armrests. The new Sole F80 treadmill offers a limited number of workout programs. 2 heart rate programs, 6 standard programs, and 2 user-defined programs. Sole’s new F80 is a tempting buy. It is the sensible middle ground between the F63 and the F85. The F63 is a basic machine while the F85 is a top-of-the-line machine. However, for most trainees though the 2013 upgrades will not matter much. The current upgrades from 2013 include a more powerful motor, a wider track, and a higher weight capacity. The program options remain constant. If you are not a current owner of the previous version of this treadmill, then the new one is something that you need to consider buying. The features highlighted in this review make it a solid buy for anyone looking to buy a solid treadmill. After all, the F80 provides good value with its well-cushioned track, commercial grade motor, audio player, as well as the overall high quality of its components. http://treadmills-online.com is very interesting and mobile friendly.